Ayurveda Migraine is termed as Shira shoola. Ayurveda aims at preservation, prevention and curing of diseases. Because of Ultramodern high society life man has become more vulnerable for many diseases which are complicated and difficult to treat. 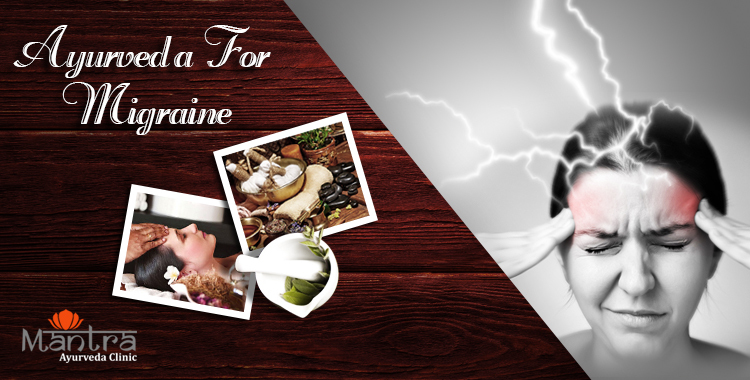 Here stressful lifestyle, food habits, habits and living conditions are the factors which are directly or indirectly influencing the manifestation of Migraine. The general pathology for migraine according to are over exposure to sun, snow, wind,inadequate sleep, suppression of natural urges, indigestion, looking continuously in one object, keeping head in one direction more much time and too much loud speaking.There is a migraine "pain centre" or generator in the brain. A migraine begins when hyperactive nerve cells send out impulses to the blood vessels, causing them to clamp down or constrict, followed by dilation (expanding) and the release of prostaglandins, serotonin, and other inflammatory substances that cause the pulsation to be painful. Emotional stress: This is one of the most common triggers of migraine headache. Migraine sufferers are generally highly affected by stressful events. During stressful events, certain chemicals in the brain are released to combat the situation (known as the "flight or fight" response). The release of these chemicals can provoke vascular changes that can cause a migraine. Repressed emotions surrounding stress, such as anxiety, worry, excitement, and fatigue can increase muscle tension and dilated blood vessels can intensify the severity of the migraine. Sensitivity to specific chemicals and preservatives in foods: Certain foods and beverages, such as aged cheese, alcoholic beverages, and food additives such as nitrates (in pepperoni, hot dogs, luncheon meats) and monosodium glutamate (MSG, commonly found in Chinese food) may be responsible for triggering up to 30% of migraines. Caffeine: Excessive caffeine consumption or withdrawal from caffeine can cause headaches when the caffeine level abruptly drops. The blood vessels seem to become sensitised to caffeine, and when caffeine is not ingested, a headache may occur. Changing weather conditions: Storm fronts, changes in barometric pressure, strong winds, or changes in altitude can all trigger a migraine. developing migraines, and if both parents have a history of migraines, the risk jumps to 75%. it's affecting the whole head. frequency of migraines varies widely among individuals. It is common for a migraine sufferer to get 2â€4 headaches per month. Some people, however, may get headaches every few days, while others only get a migraine once or twice a year. Treatment approach in Ayurveda is different from other medical systems. Ayurvedic treatment is not for the disease but it is for the particular condition of disease of the individual. Treatment and preparation will change according to the disease condition and individual. Internal preparations, external treatments and Panchakarma (purification) treatments are adopted for treating Migraine. This is done after a detailed diagnosis according to Ayurvedic methods. History of the disease with duration, previous disease history, mental state, pattern of sleep, appetite, food habits, activities, analysing the sense organs, analysing the pulse, character of stool and urine, menstrual history, etc are examined in detail. This helps to get knowledge regarding the involvement of Dosha and the intensity of the disease. Treatment is done according to these two factors. Various herbal preparations as decoctions, powders, tablets, tonics are administered if the disease is not chronic. These preparations act directly on the upper part of the body especially in the head. This action is due to the special Ayurvedic properties like Rasa, Guna, Veerya, Vipaka and Prabhava. External treatments along with the internal preparations are very effective in chronic conditions. Various kinds of paste over the forehead help for the sudden relief from the ache. The preparations help to normalize the hyper action of the nerve cells and regulates the blood circulation towards the brain. Special treatments like Sirodhara, Thalam, Sirovasty, Talapodichil, etc which is developed from Kerala helps to nourish the nerve system and there by the action of Vata is normalized. Involvement of other systemic disorder is also taken into account and treatment is done. In chronic Migraine toxic materials will be deposited in the head and affects the function of senseorgans. Due to this perception of sense organ is affected causing sensitivity to light, sound, odourand mood changes. Panchakarma helps to remove these toxins and help to strengthen the nerve system. Nasya (application of herbal preparations through nostrils) is one of the treatments which directly acts on the nerves and removes the toxins accumulated in the sinuses. Mucus coating insidethe nostrils are one of the areas where numerous nerve endings are exposed. The medicated oilsapplied through Nasya directly acts on these nerve endings and help to pacify Vata. The special preparations used for Nasya drains the mucus deposited in the sinuses there by the pressure in thisarea is relieved. Other Panchakarma treatments like Vasti (enema), Virechana (purgation) also helpsto put the toxins out from the body. After the purification treatment special preparations called Rasayana (immuno regulatory) is administered. Rasayana preparations improve the immune system further improving the perception of sense organs. Migraine due to other systemic involvement like psychological problems, digestive problems, blood pressure, ophthalmic problems, immune problem, improper menstruation, etc will be relieved when treated according to the specific treatment told for these diseases. Maintaining proper food and food habit is very important. Timely and proper quantity of food intake makes the digestion easier there by accumulation of toxins will not take place. Intake of Vata increasing food like dry, cold, food with less nourishment, intake of food in less quantity, junk food,fast foods, etc should be avoided. Kapha increasing food like heavy, cold, unctuous, food causing indigestion, etc should also be kept away. Improper activity can trigger or aggravate Migraine. Proper knowledge about activities helps to reduce intensity during the attack. It is advices to find methods to relax mind and body. Hearing music, yoga, meditation, talking with like minded persons, other deeds which help to relax should be adopted. Exposure to excess wind, cold, sunlight, etc are not advisable. Smoking and usage of alcoholic beverages are not preferable. Taking head shower in cold water, not drying the hair in a proper way, exposing head to warm weather or sunlight without proper drying and immediately after taking shower, taking cold water shower after coming from warm temperature, taking shower before digesting the food, etc can create the pathology. Staying is less oxygenated room, working with computers for long duration, continuous work which produce strain to the eyes and brain, recurring thoughts, etc should be reduced or avoided. Chronic diseases like Migraine can have a good result if proper diet and activities are followed. According to Ayurvedic principles proper food and activities are also like medicines. It also supports and catalyses the function of medicines in the body.